Red deer have been subjected to anthropogenic interference for many centuries. Most populations are managed according to hunting schedules, some have been kept long-term in enclosures and other populations have been restocked with foreign deer. The red deer in the Brittany region of north-western France only occupy the largest forests in the region, reaching quite high densities in restricted areas. Here, we aimed to assess the extent of the genetic variability of the populations in four forest fragments and investigate their population genetic structure. We show that, despite relatively large expected heterozygosity values, these geographically isolated populations are genetically impoverished relative to individuals from large continuous forests in other parts of Western Europe. We provide evidence for population genetic structure with large genetic differentiation between geographically close populations, suggesting the absence of effective exchange between the forests. Using samples from the most likely source population, we show that at least two populations were non-indigenous. 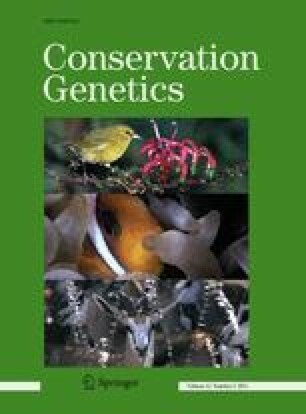 In order to limit further loss of genetic diversity, it should be a management objective to reduce isolation of the different forests, rather than further increase it by fences and hunting practices that could limit free movement of red deer. The online version of this article (doi: 10.1007/s10592-011-0230-0) contains supplementary material, which is available to authorized users. We thank Marie-Christine Eloy for her excellent technical assistance. This work was supported by grants from the Public Service of Wallonia (PSW), General Directorate for Agriculture, Natural Resources and Environment. Alain Frantz was supported by the NERC Biomolecular Analysis Facility of the Natural Environment Research Council, UK. We are indebted to all the people and institutions that provided us with samples including J.-P. Lefebvre, F. Graland, H. Chemin, L. Isebe, M. H. Labbe, M. Brunet, J.-M. Bloom; H. Chemin, C. Richard, D. Aine, N. Bon, H.-H. Seevagen, M. J. Henry, the E.A.R.L. « Les Compagnons de la Lande », the O.N.F. (National Forests Office) and the local Services of the Nature and Forest Department (General Directorate for Agriculture, Natural Resources and Environment of the Public Service of Wallonia). We are grateful to Dr. Frank Zachos and two anonymous reviewers for comments that improved the manuscript.